(Aug. 6, 2018) – In front of family, faculty and the greater St. Petersburg community, the University of South Florida St. Petersburg (USFSP) celebrated the diverse accomplishments and confer degrees during its 63rd Commencement. The University hosted a ceremony on Sunday, August 5 at 5 p.m. at the Mahaffey Theater. This was the first time USF St. Petersburg hosted a Commencement ceremony for its Summer semester. The ceremony included 143 graduates who elected to walk, representing 36 undergraduate and graduate programs. In total, 210 students were awarded bachelor’s degrees and 50 students were awarded master’s degrees. 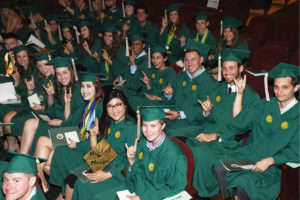 USF St. Petersburg graduates have gone on to careers in many notable organizations and government institutions, including the National Institutes of Health, the State Department, Coca-Cola, Apple and The Huffington Post. They also are highly sought by local corporations such as C1 Bank, Jabil and Tech Data. For two straight years, alumni have received the prestigious Pulitzer Prize award, one in investigative journalism for a series of articles about the opioid crisis in West Virginia and the other on a history of the Gulf of Mexico.